Prominent member of God's Property and 1NC, and backup singer for Kirk Franklin for eight years, Myron Butler has written and produced for several noted artists. With the launch of his own project, Set Me Free, he spoke with GOSPELflava.com about his new group Levi, his background in the industry, being a family man and much more. GOSPELflava.com: What prompted you to get some of the former members of God's Property back together to form Levi? Myron Butler: I knew that God had called for this to happen. The world doesn't need another CD. There are more than 100 million CDs out. I knew that God had called us to be an example of reconciliation to the Body. You can have disagreements, disputes or whatever you call it, but if the foundation is love, then that supercedes everything. You see groups go their separate ways, but you never see the reconciliation. That was one of the main reasons that I called those group members to come back together. The crazy thing is, that despite of everything that went on in GP, everyone still had a high level of respect for me. It's nothing that I tried to keep or tried to have. It was just there. When I asked, "Do ya'll want to sing with me?" They were saying, "Yeah. We've been waiting." That just kind of spearheaded it, and it grew from there. Here we are three years later. GOSPELflava.com: What is the mission of Myron Butler and Levi? Myron Butler: The mission is, number one, to win souls for Christ. We know for this time, we've been called together. Not that it had to be for the rest of our lives, or that we would be 65 still singing together. We know for this time that we have been called together. So you set your will and your desires aside, because God's call is paramount to that. So that's where we are. We are abiding here until God calls us into the next chapter. GOSPELflava.com: You have a tremendous gift for writing and producing, putting your pen to songs for Kim Burrell, LeJuene Thompson and others. With all those opportunities, you remained faithful to the ministry of Kirk Franklin for those many years. Myron Butler: I told him. On my credits, I said, "We laughed. We cried. We hurt." If I could do it all over again, I would. I believe in him as a person. I believe in his ministry. He has been there for me through some of my lowest points in life. My dedication wasn't attached to an action that he did or any amount of success. I was called to be a servant to this man. I knew that. I tell him to this day, "I can still come and sing." He was like, "It's time for you to go and fly on your own." I know the law of reciprocity. You reap what you sow. In order for you to be a great leader, you have to be a great follower. When I was with GP and with Kirk, people would ask, "When are going to do your own thing? When are you going to do this or that?" I knew that I needed to be in that servant position. Now I can know what my group members are feeling, because I was in that same place. The first song that I wrote that was commercially recorded was "Lift Him Up" from the Dallas Fort Worth Mass Choir album, Another Chance. We would have New Music Mondays in Dallas, and I presented my song. Kirk took me under his wing and said, "Hey, you really have talent." It started so long ago. I think all that combined to say, "This man has poured so much into you, and you have been an asset to him. This is where I believe God has you right now." GOSPELflava.com: You have included some great worship songs on the new album, such as "That's Who You Are" and "Redeemed". Can you talk about how you wrote those? Myron Butler: I had "Redeemed" for about six years. There is no strict regimen on how songs come to me. When riding in my car, I keep my tape recorder with me. Melodies will just drop in my head. I remember I was driving and that melody came to me. "There is song down in my heart; down in my soul." I was like, "Wow!" It's in those moments that I know this is God. It's one of those epiphanies "Redeemed" came like that. "That's Who You Are" came from my collaboration with my music director, Robert "Sput" Searight. He came to my house one day, and said, "Hey, I got this melody." He just started playing it, and it was basically the first part of the song. I was like "Yeah. Play that again." My interaction with him is really organic like that. We don't schedule times to do a writing session. He'll just come say, "Hey, I got this idea." We take it from there. "That's Who You Are" came about like that. "After we finished writing the song, we looked at each other and said, "Wow, that's kind of good." A lot of stuff is just born organically like that with us. We always sing together. We’re always doing music together. We've been doing it for so long. We’re all brothers and sisters, it's like we grew up in the same house. GOSPELflava.com: Can you tell us what Candy West brings to the group? Myron Butler: Candy brings so much. She and I have struggled through a lot. We've had aspirations to be writers. There was a time when I would write songs and she would demo them for me. All I had was a 1680. I would throw a mic in front of the door, and I would put a piece of carpet over the mike. We were just trying, we were having ideas. The things that she brings strikes a chord with me, because she and I came through the trenches together. Whether it's singing, writing or producing, she just brings it all to the table. I really pray that this situation can be a springboard for her, because she has so much to offer the body. There are others like Laron, he is a best-kept secret in Dallas. There is a plethora of hidden talent and gems that are in the group. I also know that I was called to cultivate them. I wrote 65% of the album, but I knew that I needed to be conduit or a vessel for the up-and-coming talents to explore their gifts. Not everyone's gift stops at singing. Some are programmers. Some are songwriters. That combines together to be a great asset to the group. GOSPELflava.com: As a producer and writer, you must have thought a bit who you would like to work with. Myron Butler: Man, from Vanessa Bell Armstrong to Karen Clark! I really would like to do something with Tommy Sims. He is one of those people that I kind of look to from a production standpoint. Tommy Sims is at the top. Of course you have Babyface and Quincy Jones. The quality of stuff that Tommy puts out is awesome. I bought two of his albums, and I probably burned a hole in the CDs because I listened to them so much. I really wish I could have worked with Thomas Whitfield, but he went on to meet the Lord. J Moss. He and I developed a relationship because I wrote a song on Men of Standard's second album. J Moss produced that song, and he really loved it That's how our relationship started. To this day, whenever I am at the TV show and he's there, I will sit Indian style at his feet. His gift is unbelievable. I pray that God will afford me the chance to work with him. 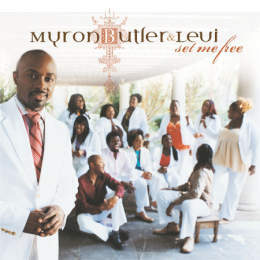 GOSPELflava.com:Can you tell me us a bit about Myron Butler ‘the family man’? Myron Butler: That is what is paramount to the music. Even before any records and any accolades, before any thing, my family comes first. That's what God has first called me to. I grew up with just my mother, and experienced the struggles that come with that. God has given me a beautiful wife and beautiful kids. I have one son. My daughter is three years old, and I was just warming some chicken for her. Those are the kinds of things that really, really matter. Everyone might not like the next record, but my family will still be here. They are are a constant in my life that I know will never change. This is dear to me because I didn't have that growing up, and now I have a chance to be a father to my son. So I really hold it close to my heart. That really takes precedent over the music and is an inspiration for the music. I tell Kirk all the time, "after the hustle and bustle of all the music, we can go and water the grass." Just basking in the simple things in life, like being able to take my kids to the park; at the end of the day that's what God really holds me accountable for.